I'm... officially impressed. 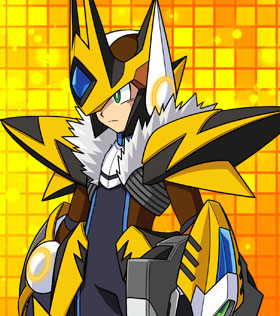 Those large shoulder pads match perfectly with the collar fur. And the Black, yellow and brown theme? Oh wow. Xover might not be a very stylish in-game but the artwork is amazing. There always was a collection viewing area, but it sucked. Everything was one big long chain to scroll through from right to left. They've just reorganized it now is all. Wow. Over-X just keeps getting sillier and sillier looking. sooo, is their a way to download this game without a Japanese itunes account. I love the design but I wish they would give the forms some more creative names. I really don't want to see Over-15 or something similar.